It should come as no surprise that the AH-64 Attack Helicopter Repairer is primarily responsible for repairing the Army's AH-64 attack helicopters Also known as "Apache" helicopters, these machines have been a vital part of the Army's combat missions since their introduction in 1986. This job, which is categorized as military occupational specialty (MOS) 15R, is a good fit for mechanically-inclined soldiers who want to learn all there is to know about the Apache and how it functions. First introduced in 1975 by manufacturer Hughes Helicopters (which was later acquired by McDonnell Douglas), Boeing has built the Apache helicopter for the Army since 1997. It was first used in combat in 1989 during the U.S. invasion of Panama and saw heavy use during Operation Desert Storm. The helicopter has not been without its challenges; issues with fuel tanks, night vision and overall survivability presented themselves during the 1990s. In addition to the U.S. Army, the Apache has been used by other countries around the world in combat operations, including Israel, the U.K., Saudi Arabia, Egypt, and the Netherlands. You'll definitely get your hands dirty if you enlist in this MOS. 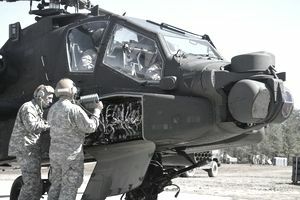 These soldiers remove and install various parts of the Apache, including engines, rotors, gearboxes, transmissions, mechanical flight controls, and related components. They prepare the helicopter for inspection and maintenance checks and assist with those inspections. They also use special tools to help troubleshoot the aircraft's subsystems and keep maintenance records. As with any soldier working on an Army aircraft, MOS 15R also have general crewmember duties as well. A soldier who enlists as an AH-64 attack helicopter repairer will spend the standard ten weeks of boot camp, formally known as Basic Combat Training (or just "Basic") and 17 weeks in Advanced Individual Training (AIT) at Joint Base Langley-Eustis in Virginia. You'll learn to disassemble and repair Apache engines, which includes repairing aluminum, steel and fiberglass airframes, and coverings. You'll also learn to fix the Apache's hydraulics, fuel, and electric systems. While there's no direct civilian equivalent to this job, your training should enable you to serve as an aircraft mechanic or service technician for an airline or aerospace company. You also may be able to pursue a career as an aviation inspector. What Job Does an Army MOS 15Y Do? What Does a Signals Collection Analyst (MOS 35S) Do? What Does a Army Wheeled Vehicle Mechanic (91B) Do?